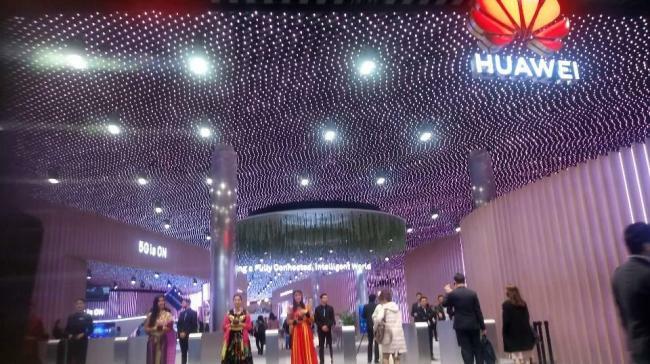 BARCELONA, Spain -- Chinese tech giant Huawei on Tuesday pledged to increase its investment in businesses’ efforts to build the next generation of the wireless network, amid controversy over security risks involving the company. During a press conference at the Mobile World Congress 2019, Huawei said the company’s technology is mature enough to address concerns that Huawei equipment could be used for hacking and espionage for the Chinese government. “We have definitely more interest to support the local operators to expand the telecommunications system. We’re expecting investing more in terms of power, net browse and money,” said Zhun Huimi, Huawei 5G global vice president and chief marketing officer. The remarks came after South Korea’s third-largest mobile carrier vowed to accelerate efforts to prevent a potential security breach by Huawei. LG Uplus is currently the only telecom company using Huawei equipment in establishing the 5G network. While LG Uplus has the smallest number of mobile subscribers, the company has built more extensive 5G infrastructure than competitors. And Huawei equipment is expected to be used for a majority of infrastructure in Seoul and the surrounding metropolitan area. LG Uplus’ chief Ha Hyun-hoi stressed that the company will take every necessary step to prevent security incidents on its Huawei-based 5G network system, such as separating networks and setting up fire walls. Last year, LG Uplus asked an international agency in Spain, which deals with security standards and verifies compliance with those standards, to verify the security of Huawei’s equipment. The results are expected in the third quarter of this year. With Korea gearing up for commercial rollout of the 5G network next month, there is mounting pressure in Washington for allies to join US-led efforts to ban Huawei from establishing the hyper-speed network. The Trump administration, however, has faced resistance from the UK, which has signaled it could mitigate security risks. Australia and New Zealand have pledged to prohibit their wireless carriers from installing Huawei gear in 5G network infrastructure. The Korean government maintains that whether to adopt Huawei equipment is up to local telecom companies. In October last year, the ICT Ministry said the government would not take the lead in verifying Chinese equipment.